What does AIRBNB stand for? What does AIRBNB mean? This page is about the various possible meanings of the acronym, abbreviation, shorthand or slang term: AIRBNB. Founded in August 2008 and based in San Francisco, California, Airbnb is a trusted community marketplace for people to list, discover, and book unique spaces around the world – online or from a mobile phone. Whether an apartment for a night, a castle for a week, or a villa for month, Airbnb connects people to unique travel experiences, at any price point, in more than 26,000 cities and 192 countries. And with world-class customer service and a growing community of users, Airbnb is the easiest way for people to monetize their extra space and showcase it to an audience of millions. Couldn't find the full form or full meaning of AIRBNB? Know what is AIRBNB? Got another good explanation for AIRBNB? Don't keep it to yourself! "AIRBNB." Abbreviations.com. STANDS4 LLC, 2019. Web. 25 Apr. 2019. 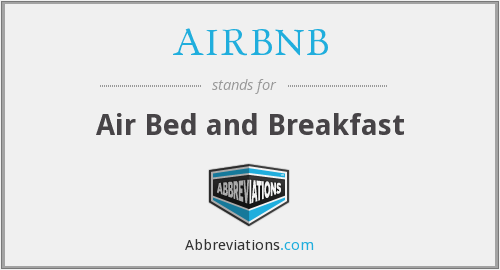 <https://www.abbreviations.com/AIRBNB>.